When it comes to custom shirts most people think of the custom fit, the price, and a few special features like monogramming. Here at iTailor it’s an entirely different story. We add design features you can’t find anywhere else online and offered at a price you won’t find anywhere else in the world. We then place that unprecedented design-ability directly in your hands. Now, when it comes to designing custom shirts on our site an argument can be made that the original 3D design engine is already on steroids and it does an excellent job. We agree, and we appreciate the thousands of customers who have let us know they feel this way. However, some, always want more and sometimes there is a yearning or a thirst that must be quenched; and we recognize that completely. 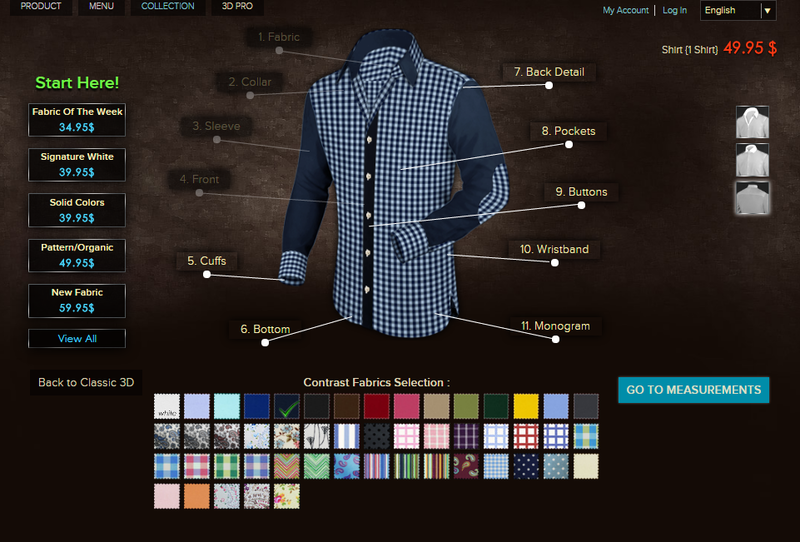 Enter in our Custom Shirts Pro* Designer. We knew there were many of you that wanted even more design options for your custom shirts, so we figured why not set yet another precedent and give them what they want. If you look at the original 3D Designer and the Custom Shirts Pro* Designer you will see that there are many similarities; the backgrounds are the exact same, you can still view all fabrics the same way, and you also have all the same shirt choices like our fabric of the week, solid colors, patterns, and certain new fabrics as well. 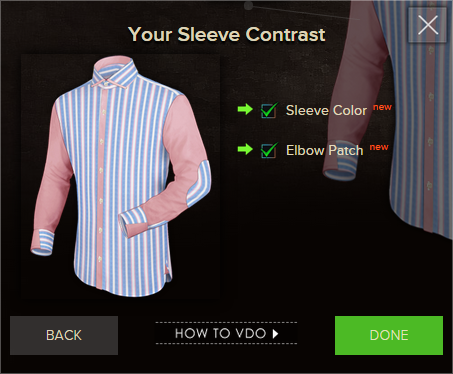 But there are differences, subtle as they may be, they surface as YOU become the virtual master tailor and utilize our more advanced and enhanced design options as you create your custom shirts. 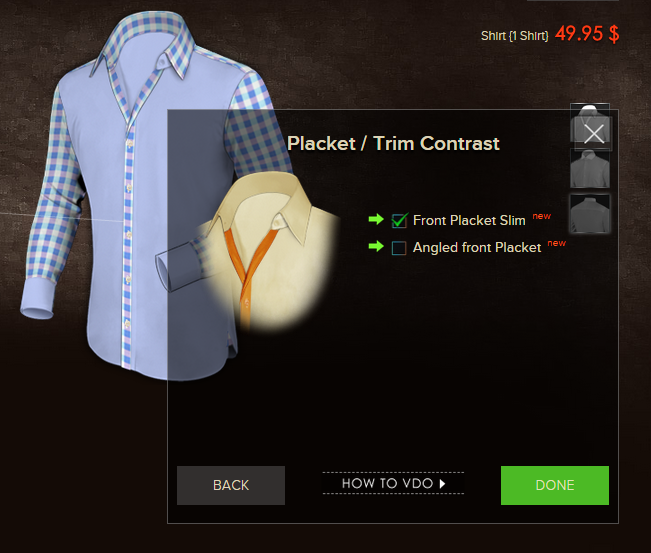 Let’s take a more in-depth look at the top 3 advantages to the Custom Shirts Pro* Designer. As you venture through the 11 design areas within the tool you will find No.4 (Front) and No.7 (Back Detail). The unprecedented design options offered in these areas will make your custom shirts as unique as you could possibly imagine or want. Under the No.4 Front area you will see in the photos below you have the options to choose a single placket, a box placket, or hidden buttons on your front placket (if you need any assistance check out the HOW TO VIDEO located in the pop up box), you also have the options to place contrasting fabric on your placket on the inside and outside, if you want it to just be trim, and or keep your placket slim or on an angle. Under the No. 7 Back Detail area you will see in the photos below you have the options to choose a plain back, box pleats, side pleats or center pleats on your custom shirts(if you need any assistance check out the HOW TO VIDEO located in the pop up box) you also then have the option to choose a back york placket. 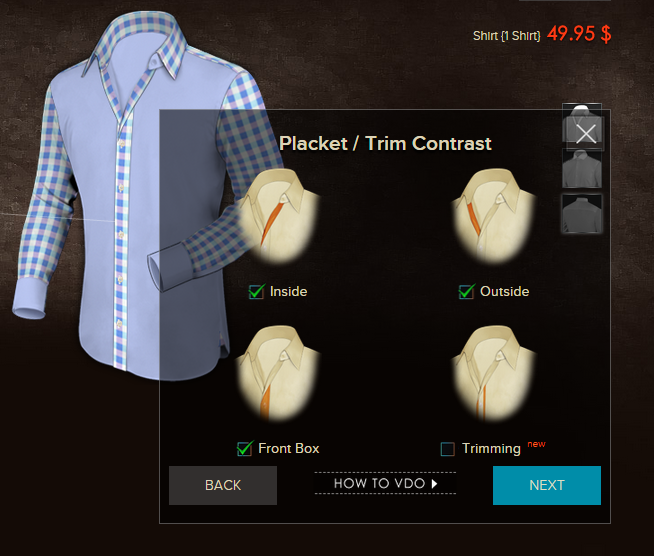 These unparalleled features are NOT offered in the original 3D designer for custom shirts and one of the top 3 reasons why you pay a little more to play a lot more in our Pro* Designer. Now when it comes the design features you can use to add truly unique style to your custom shirts, these next areas are where you can really have some fun. No.2 Collar, No.3 Sleeve, and No.5 Cuffs. Under the No.2 Collar area you will see in the photos below you have the option to choose from 13 different collar styles, and design from 7 different collar contrast styles with multiple fabrics. Under No.3 Sleeve you can choose a long sleeve, roll up, or short sleeve shirt as well as change your sleeve fabric, and add elbow patches. Finally, Under No.5 Cuffs you have the choice of 9 different cuff styles from round, mitered, and french, as well as choose from five different cuff contrast fabric styles. 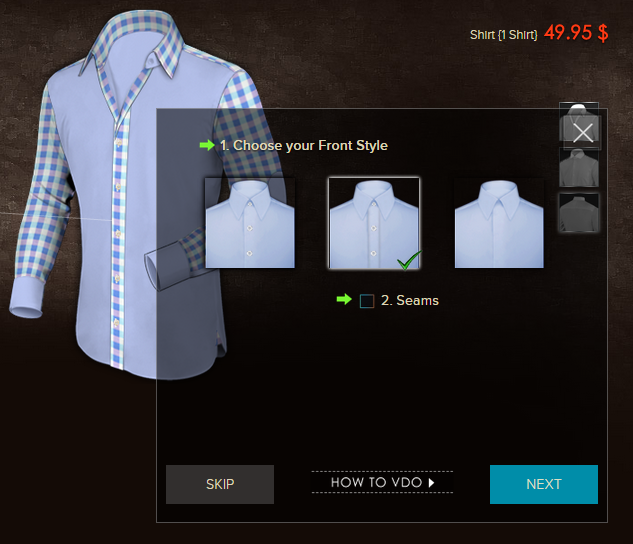 (if you need any assistance check out the HOW TO VIDEO located in the pop up box) These options are all offered in the Custom Shirts Pro* Designer. 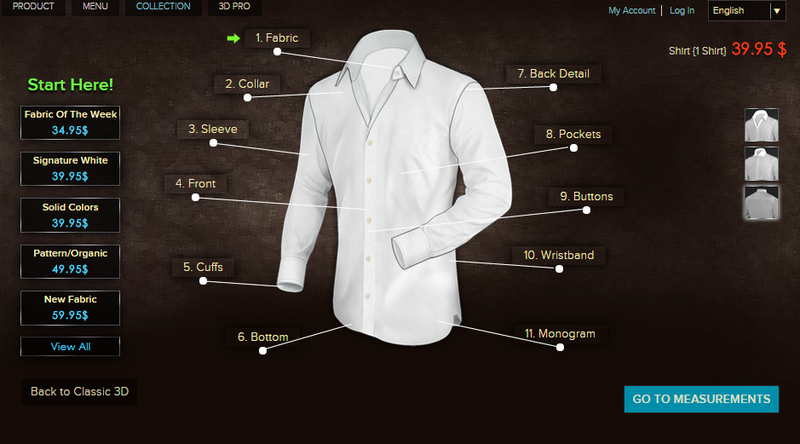 The biggest difference in the Custom Shirts Pro* Designer is the actual platform in which it sits. The design is centrally focused and right up in your face, it allows you see everything easily. All the design options are right at your fingertips as you create your custom shirts and there’s nothing distracting you from your main objective. Our data shows the majority of our customers prefer to design their tailor made shirts on either a desktop or laptop computer rather than mobile devices. This is understandably due to the vast amount of design options, colors, and intricate details that go into designing each custom garment. 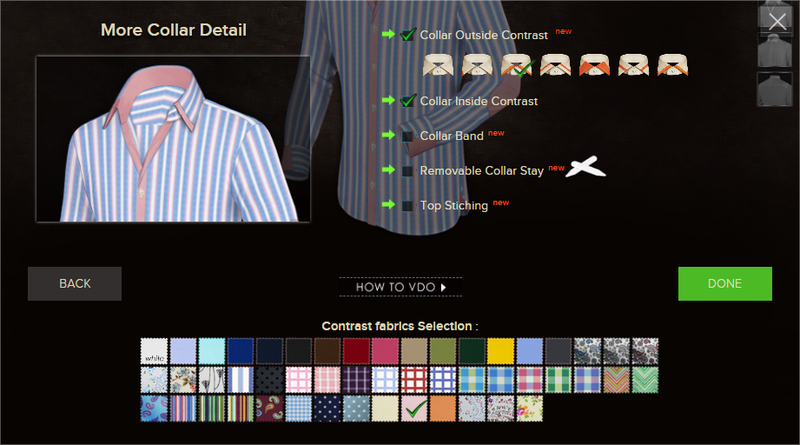 Which is one of the reasons behind the central focus with our Custom Shirts Pro* Designer. 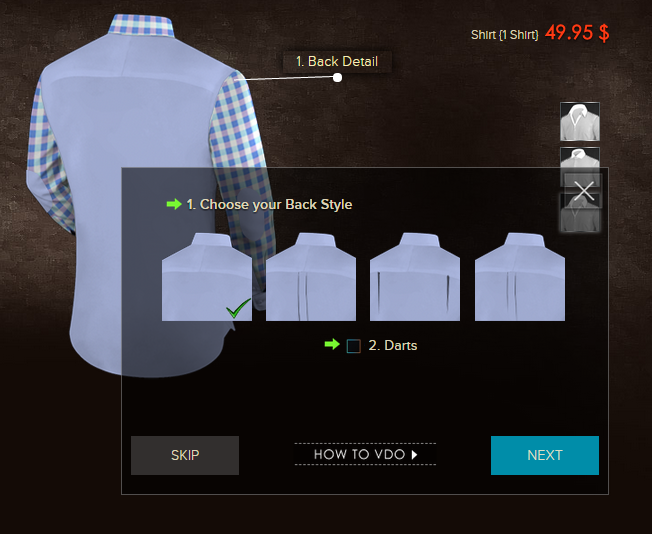 You can see all 11 categories to design with, circle back to any fabric choice on the left, and change the view of your shirt with an open or closed collar and give it a 360 degree turn to view the back as well. 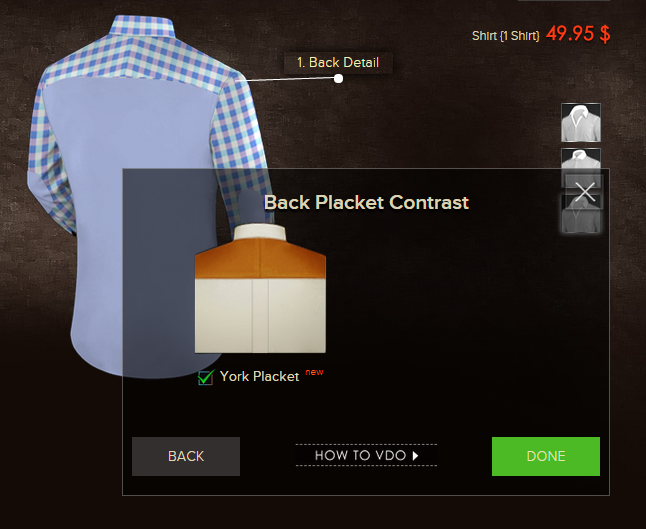 Keep these features in mind the next time you log onto our site and plan to purchase some custom shirts, they will undoubtedly grant some stand alone style. That’s it for this week, if you liked what you read or have any questions please feel free to let us know and comment below! If you’d like to design your own custom shirts from nearly 450 fabric options click here and start designing your men’s custom shirts today! Don’t forget to subscribe to our newsletter below for free company updates and our weekly sales on men’s custom suits, shirts, luxury designer shoes, and more! Do email us at contact@itailor.com for more information!